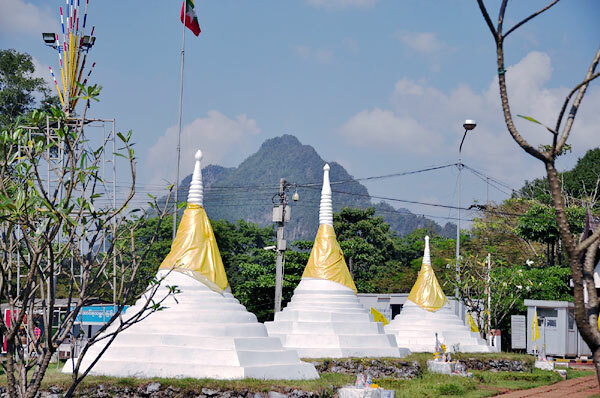 Three Pagodas Pass is far from Kanchanaburi city for approximately 215 kilometers. 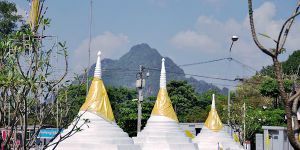 The three pagodas have unique characteristics as follow: white color, octagonal base, round body with the shape top. In the past, there are no pagodas here at first, but instead, three stone piles ware places here by locals, according to the belief of good thing will happen in their life before visiting Burma. Until in 1929, three pagodas were built by the order of Phra Sri Suwankeeree, the city ruler of Sangklaburi. Tourists who come visit here can buy souvenirs in this area, where there are a number of products come from Burma, such as accessories, gem, jade, glass beads, furniture, and cosmetic products. Apart from shopping in this area, visitors can also get into Burma for a day to visit Payathonzu. However, visitor still needs a border pass at Thai border, where you also need a copied of your passport and two passport photos. For foreigners, they also need to pay for 10 USD or 500 Baht.